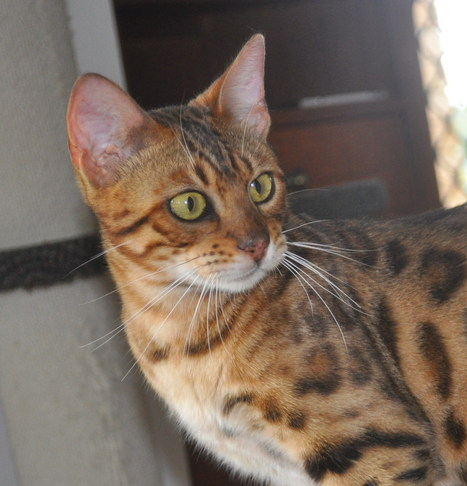 The Bengal is a relatively new breed of cat. It was developed by crossing domestic pet cats with a small forest dwelling wild cat called the Asian Leopard Cat (ALC). There are a few varieties of ALC found throughout Asia. These hybrid cats must be 5 generations of matings from the ALC to be considered a Bengal. The domestic cats used in the development initially were Egyptian Maus, American Shorthairs, Abyssinian, Ocicat and domestic shorthairs. The Bengal gets its name from the scientific name for the ALC - Prionalurus Bengalensis. The ALC has some very unique and highly desireable features that combine to give it the "wild" look, many of these features were not commonly found on the domestic cat. Some of these features are horizontal flow to the markings, two-toned rosetted markings, white tummies, spotted legs. Also desireable are the wild head types, small rounded ears, large round eyes, thick low carried tail, long bodies with hindquarters higher compared to the front. In terms of temperament, the ALC is quite a timid cat and so the domestic cats were used in the breed to bring the outgoing, friendly, sociable natures into the breed. As a breed the bengal is highly intelligent and trainable, energetic and playful, and loads of fun. The earliest mention of an ALC/domestic cross was in 1934 in a Belgian scientific journal, and in 1941 a Japanese cat publication printed an article about one that was kept as a pet. The 1960s was a period when many well known breeders, including Jean Sugden, produced ALC/domestic crosses, but records indicate that none of them took it past the F2 stage. Several zoos in Europe also produced a number of F1 ALC crosses. During this period there was an epidemic of feline leukemia and it became known that many wild cats seemed to have a natural immunity to the disease. As a result of this, Loyola University would start a research program in the 1970s to investigate if this natural immunity could be bred in or replicated. Throughout the 1960s and 1970s there a great deal of activity with hybrids, but there was no significant effort to create an actual breed from them. Around this time, Jean Sugden/Mill increased interest in her breeding efforts an contacted Dr. Willard Centerwall of Loma Linda University for his Centerwall project into Feline Leukemia. She was given some F1 hybrids from the Centerwall project. Apparently, Jean did not use local domestics to create her first Bengals as she felt the ALC was a genetically superior animal and wished to avoid weakening this element. Around 1982, the Mills made a trip to India where a zoo curator showed them a feral Indian Mau. This was how the famous rosetted domestic called "Millwood Tory of Delhi" came to be found in virtually all Bengal pedigrees. Credit also needs to be given at this point to Greg and Elizabeth Kent, who developed their own line of Bengals using ALCs and Egyptian Maus. This was a very successful line and many modern Bengals will find it in their pedigree. Jean Mills and the Kents worked hard to popularize the breed, and when the public saw the result of their work, word spread quickly. As the number of breeders and owners grew, it led to the formation of T.I.C.A. 's Bengal Breed Section. T.I.C.A. adopted the first written breed standard in 1986 and the first Bengal Bulletin was published in Nov/Dec 1988. Shortly after The International Bengal Cat Society (T.I.B.C.S. ), the Bengal Breeders Alliance (B.B.A.) and the Authentic Bengal Cat League (A.B.C.L.) were formed. These organizations exist to promote good breeding practices, discourage unscrupulous breeders, and attempt to educate people about the Bengal breed. The breed is now T.I.C.A. 's most popular registered breed.